Familiarize yourself with these famous quotes and never fail another test. You can also use the analysis of these “The Great Gatsby” quotes to help you craft your next term paper. Quote: “Whenever you feel like criticizing any one,” he told me, “just remember the advantages that you’ve had…” In consequence I’m inclined to reserve all judgments. (7). Analysis: Meet Nick Carraway, the novel’s narrator, who utters his first ironic statement. The entire novel is full of Nick’s judgments. Quote: He was content to be alone–he stretched out his arms toward the dark water in a curious way, and as far as I was from him, I could have sworn he was trembling. Involuntarily I glanced seaward–and distinguished nothing except a single green light” (24). Analysis: Meet Jay Gatsby, Nick’s new neighbor. Gatsby stares at a green light in the distance. The green light he sees shines on the dock of Daisy Buchanan, whom Gatsby loves, even though they haven’t seen each other for five years. Today, we call this stalking. The green light, in a broader sense, symbolizes the American Dream and the pursuit of wealth–something, despite his immense riches–Gatsby never achieves. Quote: Making a short deft movement, Tom Buchanan broke her nose with his open hand (37). Analysis: Meet Tom Buchanan. He’s the type of guy you pretend to like because he’s athletic, rich, and powerful. Secretly you want him to get hit by a bus (especially if you’re in the will). We see Tom’s moral decadence as he breaks his mistress’s nose for suggesting he divorce Daisy, making him a woman abuser and an adulterer. The reader immediately sees that although Tom cheats on his wife, he has no intention of leaving her. Quote: I…read a chapter of Simon called Peter–either it was terrible stuff or the whiskey distorted things, because it didn’t make sense to me (30). Analysis: One of the characteristics of modernism in literature is the sense that traditional religious institutions had failed. The fact that Nick can make no sense of a book chapter sharing its name with the first leader of the Christian church after Jesus’ death is a social commentary on the confusing nature of religion in the 1920s. The reference, however, is ambiguous. Nick is not sure whether the writing is confusing or if he’s too drunk to understand anything. Likewise, Nick suggests that either Christianity is too confusing or the receivers are too confused. Quote: “Somebody told me that he killed a man once.” “It’s more that he was a German spy during the war.” “You look at him sometimes when he thinks nobody’s looking at him. I bet he killed a man.” (43). Analysis: Just some of the rumors surrounding Gatsby and his immense wealth. Gatsby falls into the category of Byronic hero: he is shrouded in mystery, has a dark past, and is larger than life. Quote: The modesty of the demand shook me. He had waited five years and bought a mansion where he dispensed starlight to casual moths–so that he could come over some afternoon to a stranger’s garden (71). Analysis: Everything Gatsby does is to win back Daisy’s love. He’s thrown ostentatious parties for five years in the hope that Daisy will show up at one. That’s pathetic. Gatsby, Move on. She’s a gold-digger. She’s married to an imbecile who’s got more money and connections than even you do. Quote: Almost five years! There must have been moments even that afternoon when Daisy tumbled short of his dreams–not through her own fault, but because of the colossal vitality of his illusion. It had gone beyond her, beyond everything. He had thrown himself into it with a creative passion, adding to it all the time, decking it out with every bright feather that drifted his way (87). 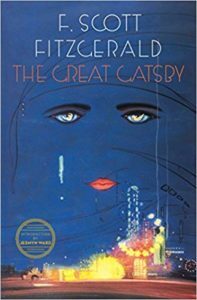 Analysis: The description of Gatsby’s dream matches the description of everything he does, from his parties to his automobile to his suits. Nick points out that the real Daisy cannot possibly live up to the imagined Daisy, something Gatsby never admits. It’s like the time I took my kids to the Grand Canyon. I had pictured in my mind a glorious day in the world’s most popular national park. It turned out to be a day of blistering heat, crying children, and annoying tourists. I feel your pain, Jay. I feel your pain. Quote: He wanted nothing less of Daisy than that she should go to Tom and say: “I never loved you.” After she had obliterated four years with that sentence they could decide upon the more practical measures to be taken (99). Analysis: SImply stealing a man’s wife, albeit a despicable man’s wife, isn’t enough for Gatsby. He wants to pretend the previous four years never existed. Gatsby displays the foolishness of wanting to repeat the past. Quote: “That’s because your mother wanted to show you off.” (104). Analysis: Daisy brings out her daughter, not because she loves her, but because she wants to show her off. To Daisy, everyone is an object. Quote: Her voice is full of money (107). Analysis: Nick is trying to explain Daisy’s nature when Gatsby makes the comment that “Her voice is full of money”. Nick confirms this with his inner thoughts: “High in a white palace the kings daughter, the golden girl” (107). Disagree with my analysis? Think I’m the greatest literary genius since Shakespeare? Let me know by clicking “comments” at the top of the page. Fitzgerald, F. Scott. The Great Gatsby. New York: Charles Scribner’s Sons. 1953. Lorcher, Trenton. His Brain. Several Readings and Multiple Teachings of The Great Gatsby from 1998 – Present. Don’t get humiliated in front of your friends and riddled with bullets on your next exam. Take a look at this study guide instead.